New Mexico Consortium Supports Quantum Dot Start-Up UbiQD, LLC, a quantum dot start-up, begins operations in the NMC. February 3rd, 2015, Los Alamos, NM -- Dr. Hunter McDaniel has launched UbiQD, LLC, a quantum dot manufacturing business located in the New Mexico Consortium’s (NMC) Los Alamos laboratory. “The NMC is exploring models for facilitating small technology startups that benefit from New Mexico relationships and resources,” noted Katharine Chartrand, Executive Director of the New Mexico Consortium. “These are the relationships that have the greatest potential New Mexico impact.” UbiQD, LLC produces quantum dots; semiconductor nanocrystals that absorb light across a broad spectrum and then very efficiently emit light with a narrow spectrum (i.e., a single color). Quantum dots can replace expensive organic dyes, reduce the cost of photovoltaic devices, and improve the performance of solid-state lighting. Displays such as televisions and tablets increasingly incorporate quantum dots, but those dots are composed of toxic materials like cadmium selenide or indium phosphide. UbiQD, LLC manufactures quantum dots that avoid heavy metals and are believed to be nontoxic. The company’s quantum dots are made using an inexpensive manufacturing process from readily available raw materials; composed of elements like copper, zinc, and sulfur. Like the previous generation of quantum dots, the color of UbiQD’s materials can be tuned with their size to fit many different applications. For example, to absorb different portions of sunlight or tailor a spectrum for indoor lighting. “The combination of low-cost, low-toxicity, and effective performance means these materials will soon become ubiquitous,” explained Dr. McDaniel, when asked about the company’s name. Some current examples of nanocrystal technology in the marketplace include transistors, sunscreen, LCD TVs, smartphones, tablets, lasers, and medicine. While there are many applications for quantum dot technology, Dr. McDaniel sees more of a future, and less market competition, in applications such as marketing, safety, and design. “Imagine logos that glow in the sun, paint that shines in car headlights, or fluorescent cosmetics. These are massive markets with tremendous potential,” Dr. McDaniel said. “We are also excited about the opportunities for quantum dots to improve the quality and efficiency of solid-state lighting.” “The quality of life, the technical workforce and the Los Alamos brand make Los Alamos a great place for small technology business,” said Chartrand. “We need to develop Los Alamos’ nascent cluster of tech companies; these companies benefit from proximity and strengthen each other. 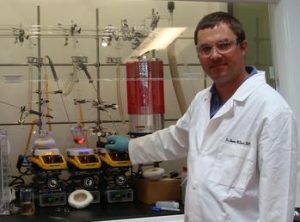 UbiQD, LLC is a great addition to the community.” Dr. McDaniel received his PhD in Materials Science and Engineering from the University of Illinois at Urbana-Champaign in 2011, and completed a post-doctoral research assignment at Los Alamos National Laboratory’s Center for Advanced Photophysics this summer. He has published more than 20 scientific papers on quantum dots, and has filed six patents. Dr. McDaniel and his team, comprised of six experts in business, commercialization, and quantum dots science, are currently working together to expand quantum dot manufacturing capacity, improve performance, develop industrial partnerships, and build the UbiQD brand internationally. About the New Mexico Consortium The New Mexico Consortium (NMC) is an innovative effort to engage universities and industry in scientific research in the nation's interest and to increase the role of Los Alamos National Laboratory (LANL) in science, education and economic development. This non-profit corporation formed by the three New Mexico research universities focuses on facilitating collaborations at the Laboratory interface. The NMC leverages capabilities at LANL, universities and industry and provides agile and accountable operations to execute joint initiatives. The NMC develops and manages self-sustaining research facilities to support these joint initiatives. Through the NMC, the universities and LANL have developed more effective models to advance our nations interests and increase the impact of scientific research on the local and national economy. For additional information contact Shannan Yeager, Director of Community Relations at 412-6898 or syeager@newmexicoconsortium.org. For additional information about UbiQD, LLC, visit their website at www.ubiqd.com. For additional information about the New Mexico Consortium visit our website atwww.newmexicoconsortium.org.